The market is segmented by Application (Intermediate, Antioxidant, Polymerization Inhibitor, Photosensitive Chemical, and Other Applications), End-user Industry (Cosmetics, Polymers, Paints and Adhesives, Rubber, and Other End-user Industries), and Geography. 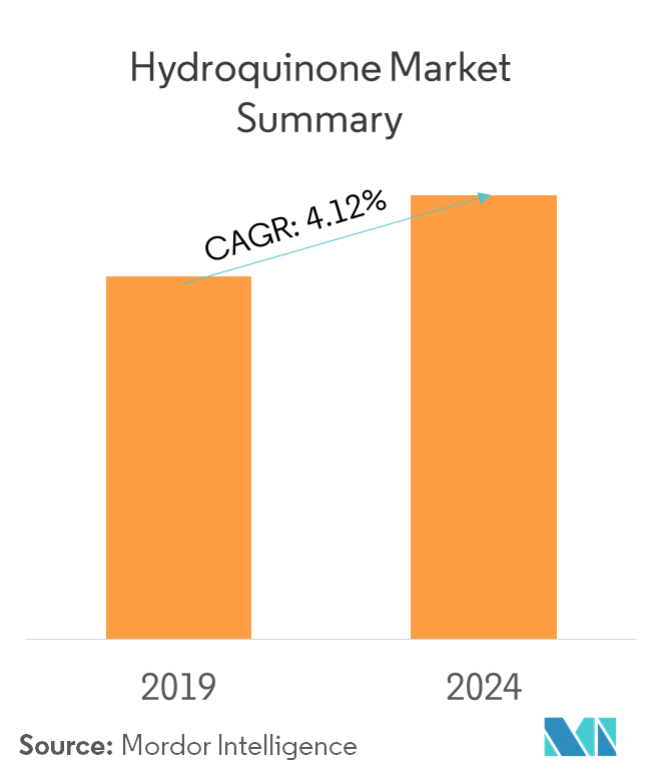 The market for hydroquinone is expected to register a CAGR of 4.12% during the forecast period (2019-2024). Major factors driving the market studied are the rising demand from superabsorbent polymers and increasing demand from the paint industry. However, toxic nature and carcinogenic effects of hydroquinone are expected to hinder the growth of the market studied. Antioxidant application dominated the market in 2018, and is expected to grow at the same pace, during the forecast period. Polymerization inhibitor is expected to grow at the fastest rate in the coming years. Surging demand for hydroquinone from the paint industry is expected to drive the market. 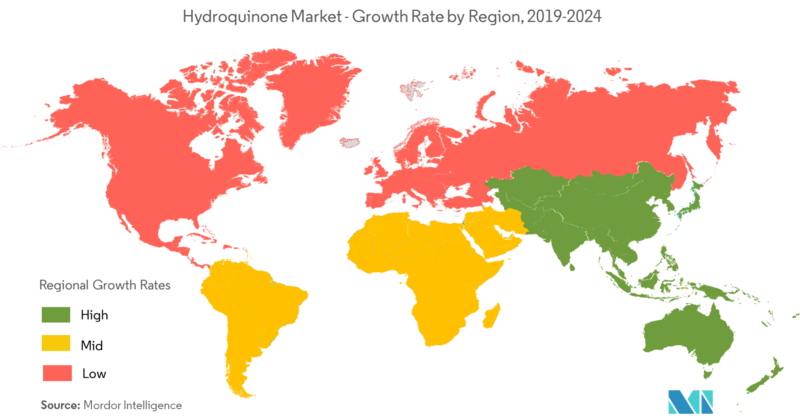 Asia-Pacific dominated the hydroquinone market across the world, with the largest consumption from countries, such as China and India. Hydroquinone ethers are used in the production of superabsorbent polymers, which form a part of large cross-linking networks, to enable absorption of large amounts of fluids. The usage of hydroquinone is considered to be of high importance in the production of superabsorbent polymers. Superabsorbent polymers (SAPs) are materials that possess the ability to absorb and retain large volumes of liquid or aqueous solutions. This makes them ideal for use in water absorbing applications, such as baby nappies, adult incontinence pads, absorbent medical dressings, and controlled release drugs. The baby diaper segment consumes nearly 72% of the total superabsorbent polymer production. Growing population of infants in emerging countries is due to high fertility rates and lack of education. In addition, adult incontinence products are used in nursing homes and hospitals to provide considerable advantages to both patients and the nursing staff. The market for incontinence products has grown significantly, due to increasing popularity in home care environment in developed regions. 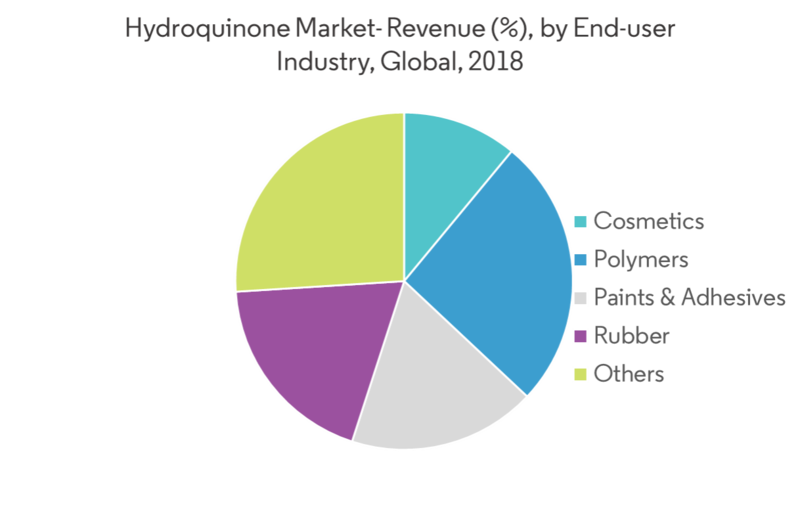 Overall, the growing awareness for hygiene among all population groups is expected to promote the usage of superabsorbent polymers (diapers, pads, and sanitary napkins), which, in turn, may augment the growth of hydroquinone during the forecast period. The Asia-Pacific region was found to be the major consumer of hydroquinone in 2018, supported by the growing consumption from major countries, including China, India, Japan, and ASEAN countries. The demand for hydroquinone in India and China is expected to grow significantly. The cosmetics industry is expected to grow in the region, with the ongoing innovation in South Korea and Japan. China is expected to a major consumer of cosmetics in the region. The paints and adhesives industries in the region are likely to grow at a moderate rate, influenced by the growth in GDP, automotive builds, and industrial production and construction activities. The personal care sector is expected to grow at a robust pace during the forecast period, primarily driven by baby and child-specific products, depilatories, oral care, color cosmetics, and skin care, among others. India’s construction sector has been growing rapidly, with increased investment by the government. The Indian government's ‘Housing for All by 2022’ initiative is also a major game changer for the industry. The growth of commercial real estate has been driven largely by service sectors, especially IT-ITeS. The government’s initiative to develop smart cities and build almost 30 million homes, by 2022, is likely propel the demand for paints and coatings, which, in turn, is likely to fuel the demand for hydroquinone during the forecast period. Thus, owing to the aforementioned trends, the hydroquinone market in the region is expected to be positively affected during the forecast period. 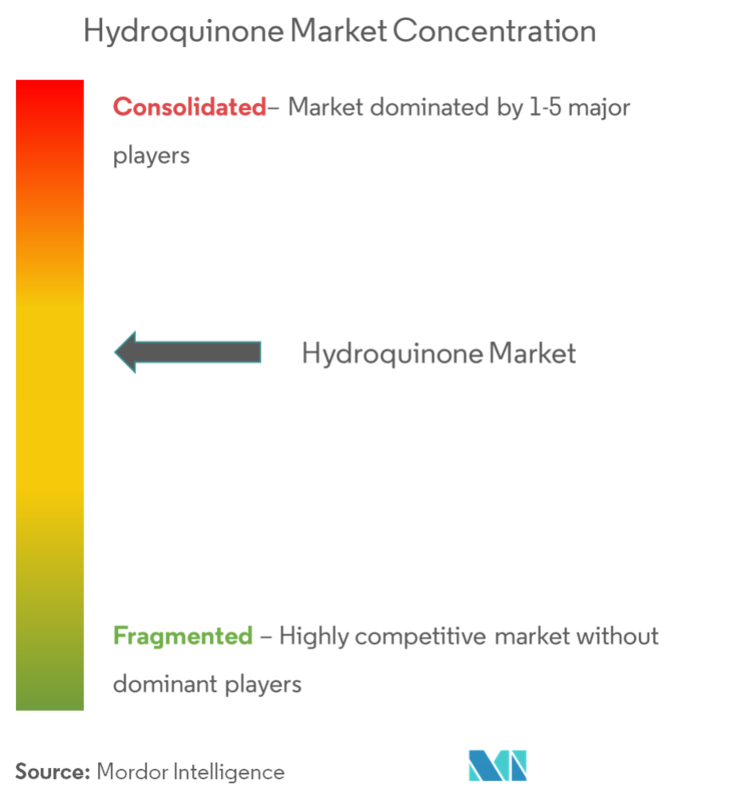 The hydroquinone market is consolidated, with top players accounting for significant share of the market. The major companies include Solvay, UBE Industries Ltd, Eastman Chemical Company, Mitsui Chemicals Inc., and Camlin Fine Sciences Ltd. Other small considerable manufacturers include Tianjin Zhongxin Chemtech Co. Ltd, YanCheng FengYang Chemical Co. Ltd, and Kawaguchi Chemical Industry Co. Ltd.